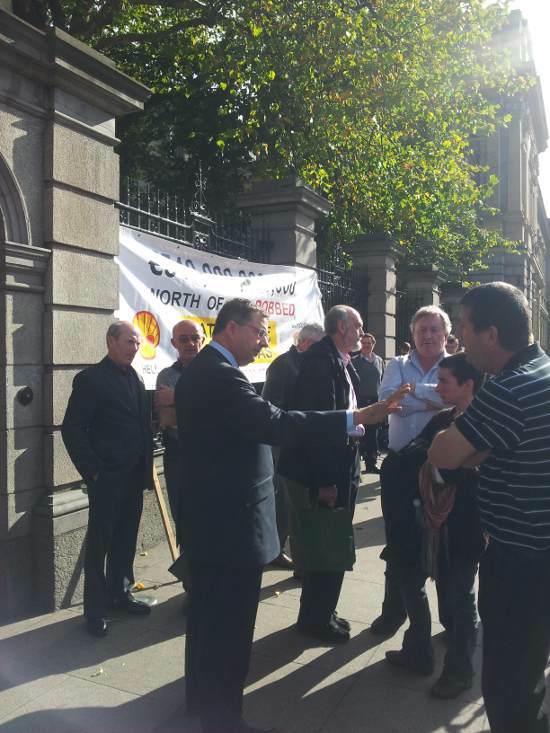 SECURITY STAFF at the Houses of the Oireachtas yesterday refused entry to a group of opponents of the Corrib gas terminal who had travelled from Co Mayo to attend an Oireachtas committee. The group of 15 Shell to Sea supporters travelled to Dublin at the invitation of Fianna Fáil deputy leader Éamon Ó Cuív to attend a hearing of the Oireachtas Committee on Communications, Natural Resources and Agriculture about offshore exploration licences. Today, local Shell to Sea people from Kilcommon together with independent observer Fr. Michael Nallen, Parish Priest, travelled from north Mayo at the invitation of Éamon Ó Cuív to attend a Dáil Committee meeting on Natural Resources. Sr. Majella McCarron, Table Observer was also present. The group was first told that the public gallery of the committee meeting room was full and they would be put into a separate room with a video link. They were then told that the Captain of the Guard, John O Flaherty had decided that they were a protest group and were not to be allowed inside the gates of the Dáil. Éamon Ó Cuív, who had been provided with a list of the names of local people and observers beforehand declared that he was “powerless” to do anything about the barring order. A multinational oil company wants to build a pipeline through a pristine, fragile environment. The people who live there protest against the pipeline and the company. Sound familiar? It's not Nebraska. It's the west coast of Ireland. It's not the Sandhills. It's bogs and fishing grounds. The proposed pipeline won't carry oil but rather natural gas. ‘Strength in community’ is an image selected from “The social archive”, an on-going archive documenting various social movements in Ireland over the past 10 years. The archive was initially developed as a personal attempt to record the many voices of dissent and ideas not represented in Irish society throughout the Celtic Tiger. The initiation of the archives shares a similar timeframe to the resistance of a small rural community in the West of Ireland, to an infrastructural project they perceive as a threat to their community, health, and environment. Irish folk legend Andy Irvine will kick-start a tour of the East Coast over the coming weeks, arriving in Boston on Thursday October 6 to play the city’s newest Irish pub Four Green Fields. The gig will mark Irvine’s first time playing in the city since the 1990s and will showcase songs from his latest album, Abocurragh, as well as other classics from his prolific career. A former oil worker, a special needs teacher and a former IT worker were among 17 protesters opposed to the Corrib gas project who appeared before last week’s sitting of Bemullet District Court. Mickey Coleman has announced the release of his new single Pat O’Donnell Shell to Sea. On Monday, September 19, 2011, the song will be available for purchase as a download.